27 BC - 493 AD Part of the Roman Empire (as Illyricum). 15 Mar 493 - 535 Ostrogothic rule (see Italy). 535 - c.810 Part of the Eastern Roman (Byzantine) Empire. to between the Drava and Sava River valleys. Aug 843 Transferred to Frankish Italy overlordship. 12 Aug 875 Reverts to Frankish overlordship (along with Italy). in 1093 elect Petar Svacic king of Croatia. May 1097 Hungary conquers Croatia. the Mongols sack Zagreb in 1242.
in the royal style of Croatia before 1777.
formally crowned on 3 Nov 1527. 14 Oct 1809 Annexed by France, part of the Illyrian Provinces. 25 Dec 1809 Croatie province within the Illyrian Provinces. both within the Illyrian Provinces. 19 Aug 1813 Karlstadt (Karlovac). 30 May 1814 Croatia formally restored to Austria. Illyrian Kingdom (see Austrian crownlands). Illyria are restored to Hungary. Hungary, but within the Austrian Empire. 19 Apr 1848 - 13 Dec 1868 Under direct Austrian administration. Croatia and Slavonia used 1864-1888). 1873) abolished and incorporated into Croatia. 29 Oct 1918 End of personal union with Hungary declared. Slavonia by the Treaty of Trianon. 26 Aug 1939 Autonomy as Banovina Hrvatska (Banate of Croatia). in the west until 10 Sep 1943]). 15 May 1941 - 12 Sep 1943 Nominally a kingdom¹. 11 Sep 1943 Croatia annexes Italian Dalmatia (except Zadar). 4 Dec 1943 Re-incorporation into Yugoslavia declared. Independent State of Croatia to 8 May 1945). 8 May 1945 Yugoslav forces re-take Zagreb. 29 Nov 1945 Part of Yugoslavia. 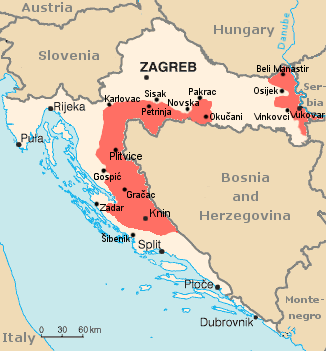 31 Jan 1946 People's Republic of Croatia (within Yugoslavia). 9 Jun 1963 Socialist Republic of Croatia (within Yugoslavia). 31 Mar 1991 - 12 Nov 1995 Croatian war of independence. 25 Jun 1991 Independence declared. 8 Jul 1991 - 8 Oct 1991 Independence suspended. and legal relations with Yugoslavia. 19 Dec 1991 - 5 Aug 1995 Serbian Krajina independent (not recognized). (e) 18 May 1941 - 31 Jul 1943: Kralj Hrvatske ("King of Croatia"); used style Duca di Spoleto (from 3 Mar 1942 d'Aosta") e Re designato di Croazia; ("Duke of Spoleto [from 3 Mar 1942 Aosta] and King-designate of Croatia"). ²By a law of 15 May 1941, Croatia was declared to be a kingdom. At the Government's request, King Vittorio Emanuele III of Italy designated Principe Aimone di Savoia-Aosta, duca di Spoleto (from 3 Mar 1942 duca d'Aosta)(s.a.) to be king, and he accepted his designation as King - designate on 18 May 1941, under the style Tomislav II. But, he was neither proclaimed nor installed in Croatia; he was styled duca di Spoleto (later "d'Aosta") e re designato di Croazia; he abdicated on 31 Jul 1943 and formally resigned his designation on 12 Oct 1943. Noble and Ecclesiastical Titles: biskup = bishop; comte, conte, graf, gróf = count; freiherr, báró = baron; herceg, herzog = duke; fejedelem, fürst, principe, prinz = prince. Territorial Disputes: Dispute remains with Bosnia and Herzegovina over several small sections of the boundary related to maritime access that hinders ratification of the 1999 border agreement; since the breakup of Yugoslavia in the early 1990s, Croatia and Slovenia have each claimed sovereignty over Pirin Bay and four villages, and Slovenia has objected to Croatia's claim of an exclusive economic zone in the Adriatic Sea; in 2009, however Croatia and Slovenia signed a binding international arbitration agreement to define their disputed land and maritime borders, which led to Slovenia lifting its objections to Croatia joining the EU; Slovenia continues to impose a hard border Schengen regime with Croatia, which joined the EU in 2013 but has not yet fulfilled Schengen requirements. not recorded in the royal style of Croatia. 1476 End of the appointment of separate Bans of Slavonia. 1524 - 14 Jul 1700 Incorporated into the Ottoman Empire. of the Croatian royal style from 1777.
of a Serbian National Council. 30 Sep 1990 Serb autonomy declared by Serbian National Council. 28 Feb 1991 Secession from Croatia, but not Yugoslavia, declared. Srpska (by declaration, to no effect). 29 May 1991 Satute for Serbian Autonomous Region of Krajina ratified. 25 Jun 1991 Croatia declares independence. Jul 1991 Yugoslav invasion of Croatia. [Republika Srpska Krajina] (recognized only by Serbia). 5 Jan 1992 Western Slavonia joins Krajina. 26 Feb 1992 Eastern Slavonia, Baranja and Western Srem joins Krajina. Serbs (Republika Srpska); but it is opposed in Western Srem. the eastern Srem-Baranja District until 1997. 15 Jan 1998 Re-integration of Srem-Baranja into Croatia. formed secretly in Šidski Banovci. 7 Jan 1991 Regional assembly for Western Slavonia established. Serbian National Council at Osijek. Baranja and Western Srem established at Tripinja. 12 Aug 1991 Serbian Autonomous Western Slavonia Region established. 25 Sep 1991 Government formed. 18 Nov 1991 Yugoslav occupation of Vukovar. 26 Feb 1992 Eastern Slavonia, Baranja and Western Srem merged into Krajina. 2 May 1995 Serb pocket in Western Slavonia eliminated by Croatian forces. in the eastern part (Srem-Baranja District). established, in opposition to occupation. held in feudal tenure by the Bishops of Pola. Lords of Duino (Tybein)(under Aquileia). 1233 - 1365 Fief of the Frankopan family (confirmed 1260)(under Aquileia). formally wave rights to Fiume by treaty to the Count of Duino. 1365 - 1399 Fief of the Lords of Duino (under Aquileia). are inherited by the Lords of Walsee (Wallsee). 1 Sep 1465 Fiume is promised (on death) to the Habsburgs, which occurs 1466. 26 May 1508 - Jun 1509 Venetian occupation. Jun 1509 - Oct 1509 Croatian occupation. 2 Oct 1509 - 1511 Venetian re-occupation. 23 Jul 1530 Styled Magnifica comunitas terrae Fluminis S. Viti. continue to claim their rights over the city to 1809. 2 Jun 1717 Declared a free port (until 1891). 28 Apr 1747 Administration of the Littoral unified under Intendancy in Trieste. 23 Apr 1779 "Corpus separatum" of the Hungarian Crown. 5 Apr 1797 - 10 Apr 1797 French occupation. 28 May 1809 - 3 Jun 1809 French occupation. 14 Oct 1809 Annexed to France, part of the Illyrian Provinces. 25 Dec 1809 Province of Fiume, within Illyrian Provinces. and part of Croatie province, within Illyrian Provinces. 3 Jul 1813 - 26 Aug 1813 British occupation. 26 Aug 1813 Austrian occupation. 30 May 1814 Formally restored to Austria. 1 Nov 1814 Subordinated to Trieste (as Kreisamt zu Fiume). the Landesgubernium in dem Königreiche Illyrien zu Triest. 1 Nov 1822 Fiume and the Hungarian Littoral are restored to Hungary. 31 Aug 1848 Administered by the Ban of Croatia. 4 Mar 1849 Incorporated into Croatia. 7 Apr 1850 Fiume a county within Croatia. 21 Dec 1867 "Corpus separatum" of the Hungarian Crown. 23 Oct 1918 Occupied by Croatian forces. Associated Powers (including Susak from 17 Nov 1918). 17 Nov 1918 Occupied by Italian forces. 14 Sep 1919 Occupied by forces under Italian Gabriele D'Annunzio. 8 Sep 1920 Reggenza Italiana del Carnaro (Italian Regency of Carnaro). Croats and Slovenes agree to the independence of Fiume. Jan 1921 - 1921 Occupied by Italy. 17 Mar 1922 Re-occupied by Italy. on 16 Mar 1924) and Sušak (Porto Barros) annexed to Yugoslavia. 24 Apr 1945 Occupation by Yugoslavia begun (Fiume city occupied 3 May 1945). Rijeka and Sušak are merged). 25 Jun 1991 Part of independent Republic of Croatia. Noble Titles: comte, graf, gróf = count; freiherr, báró, barone = baron; fürst, principe, prinz = prince. under Frankish overlordship (see under Croatia). Byzantine cities and islands, as under Frankish domain. 812 - 1001 Byzantine rule at Iadera/Zara (and 1041-1097, 1167-1181). 812 - 1084 Byzantine rule at Spalatum/Spalato (and 1171-1180). c.829 Dalmatia part of the Duchy (from c.988, Kingdom) of the Croats. permanent impact here was Croatia. 1311-Sep 1313, 1345-Jul 1346, and 18 Feb 1358-1403). 23 Nov 1202 Zadar destroyed by Venice during the Fourth Crusade. 1328 - 18 Feb 1358 Dalmatia (incl. Split) largely under Venetian rule. 1390 - 1391 Bosnian rule over Adriatic littoral between Šibenik and Kotor. 19 Jul 1403 - 9 Jul 1409 Kingdom of Sicily ("Naples") rule at Zara. 1510 - Oct 1514 Rebellion against Venetian rule on Island of Hvar. 12 Mar 1537 - 14 Jul 1700 Dalmatian interior is incorporated into the Ottoman Empire. 30 Jun 1797 Zara occupied by Austria. the Kingdom of Dalmatia (Königreich Dalmatien). 28 Feb 1806 - 12 Aug 1807 Russian occupation of Cattaro (see under Montenegro). 26 Dec 1805 Dalmatia is ceded to France by Austria. 18 Feb 1806 French administration begins in Zara (in Knin from 12 Feb 1806). (Kotor), within the Kingdom of Italy. 31 Jan 1808 Republic of Ragusa is dissolved and incorporated into Dalmatia. 14 Oct 1809 - 6 Dec 1813 Annexed to France, as part of the Illyrian Provinces. Görz (Gorizia), Istria, Ragusa, Trieste, and part of Carinthia). 15 Apr 1811 Intendance of Dalmatie established within Illyrian Provinces. 28 Oct 1813 - Jul 1815 British occupation of some coastal ports and islands. 2 Nov 1813 Split (Spalato) occupied by Austria. 6 Dec 1813 Zara (Zadar) occupied by Austria. 29 Jan 1814 Ragusa (Dubrovnik) occupied by Austria. 30 May 1814 Dalmatia formally restored to Austria. 11 Jun 1814 Cattaro (Kotor) area occupied by Austria. 7 Mar 1849 March Constitution prohibits unification of Dalmatia and Croatia. 1849 - 1861 Administration subordinated to the Ban of Croatia. 26 Feb 1861 Dalmatia a crownland of Austria. 6 Apr 1861 Dalmatia autonomous. 21 Dec 1867 Part of "Austrian half" of the Austro-Hungarian Monarchy (i.e. of the "Kingdoms and Lands Represented in the Imperial Diet"). Oct 1869 - Feb 1870 Rebellion at Cattaro (Boka Kotorska). 1881 - 1882 Rebellion at Cattaro and Krivošije. Slovenes, Croats and Serbs in Zagreb). (with local autonomy until 18 Jul 1924). 1 Dec 1918 Dalmatia part of the Serb, Croat, and Slovene State. 10 Sep 1919 Formally ceded to the Serb, Croat, and Slovene State by Austria. but Zara and a few islands are annexed to Italy. of provincial administration end 18 Jul 1924). Zetska (Zeta) Banovina (within Yugoslavia). Split formed in charge of the temporary autonomous Dalmatian areas. end of the department of the Banal government at Split. Dalmatia, then divided as provinces of Split, Zara and Cattaro). Italian and later German occupation). 10 Sep 1943 - 27 Sep 1943 Split briefly liberated by Croat/Yugoslav partisan units. 11 Sep 1943 - 8 May 1945 Dalmatia occupied by the Germans. Noble Titles: comte, conte, graf, gróf = count; freiherr, báró, barone = baron; fürst, principe, prinz = prince; reichsgraf = imperial count; ritter = knight; vicomte = viscount. Note: Personal names in Dubrovnik had several variants for example Patrician families of Dubrovnik had Latin, Italian, and Croatian versions of their last names - for example Zamagna, Giamagno, or Džamanjić; Gozze, Goçe, or Gučetić; Poza, Poça, or Pucić; Babalio, Bobali, or Bobaljević; Menze, Mençe, or Menčetic; Grade, Gradi, or Gradić; Crosio, Croze, or Krušić; Georgio, Giorgi, or Đurđević (Djurdjević). c.614 Ragusium founded in the Eastern Roman (Byzantine) Empire. 866 - 867 Under siege by Saracens. 1000 - 1018 Under the sovereignty of the Venetian Republic. 1080 Elafitski (Elafiti) Islands (Giuppana, Mezzo, Calamotta) annexed. 1081 - 1085 Under sovereignty of Norman Duchy of Apulia. 1169 - 1172 Under sovereignty of Byzantine Empire. 1172 - 1173 Under sovereignty of Venice. 1180 - 1190 Under the sovereignty of the Norman Kingdom of "Sicily" (Naples). 29 Aug 1189 First official document where city is referred to as Dubrovnik. 1205 - 18 Feb 1358 Under sovereignty of Venice. 1216 Lastovo (Lagosta) Island annexed. c.1235 Consilium maius (Grand Chamber) established. c.1252 Consilium rogatorum (Ragusan Senate) established. 16 Aug 1296 Fire destroys almost entire city. 1333 Pelješac (Sabbioncello) peninsula annexed. 1345 Mljet (Meleda) Island annexed. 18 Feb 1358 - 1458 Under suzerainty of Hungary (ratified 27 Jun 1358). 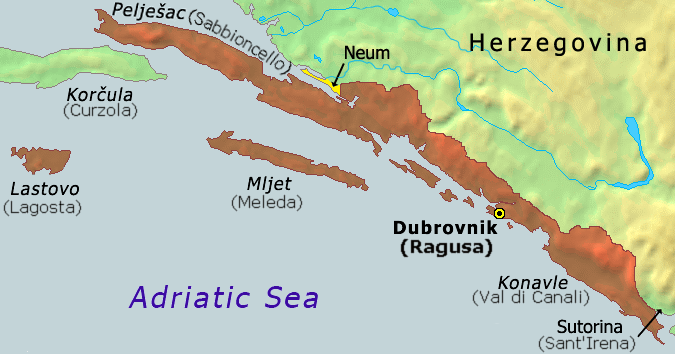 1399 Area between Ragusa and Pelješac, called the Primorje, annexed. occupied by Ragusa (ceded to Venice in 1417). 1442 - 1686 Ragusa tributary to the Ottoman Empire (confirmed 13 Nov 1458). 1686 - 1696 Under Habsburg protection. 1693 - 31 Jan 1808 Ragusa tributary to the Ottoman Empire. Jul 1465 - Aug 1465 No election or Rectors due to plague. 6 Apr 1667 Devastating earthquake struck and kills over 5,000 citizens. Republic of Venice would be unable to attack from land. 26 May 1806 - 31 Jan 1808 French occupation. which is part of the Napoleonic Kingdom of Italy. 14 Oct 1809 - 20 Sep 1813 Annexed to France; part of the Illyrian provinces (see Dalmatia). 25 Dec 1809 Raguse-et-Bouches-du-Cattaro province within Illyria. 15 Apr 1811 Intendance of Raguse, within Illyria. 20 Sep 1813 - Jul 1815 British occupy the islands of Sipan, Lopud, Kolocep and Cavtat. 18 Jan 1814 - 29 Jan 1814 Republic of Ragusa (restored). 29 Jan 1814 Austrian occupation. 30 May 1814 Formally annexed to Austria (continues as part of Dalmatia). 18 Dec 1918 Part of the State of Serb, Coats, and Slovenes (later Yugoslavia). 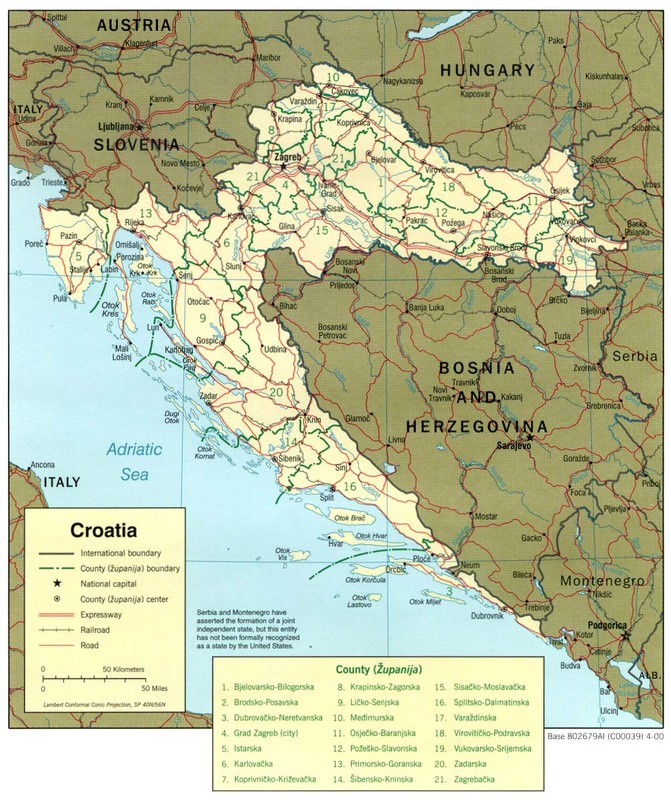 17 Apr 1941 - May 1945 Part of Croatia (within Italian zone to 10 Sep 1943). 10 Sep 1943 - 18 Oct 1944 Occupied by Germany. 18 Oct 1944 Re-incorporated into Yugoslavia/Croatia. 1 Oct 1991 - May 1992 Under siege by Yugoslav federal army. 13th cent First Statute of Poljica composed (revised 1322, 1387). 1440 Second Statute composed (revised 1444 and c.1485). 3 Mar 1444 - 1671 Under Venetian Republic suzerainty. 1671 - 1684 Under Ottoman suzerainty. 1684 - 1797 Under Venetian Republic suzerainty. 18 Nov 1797 - 1806 Austrian occupation of Dalmatia and Poljica. 1806 - 1807 French occupation of Dalmatia and Poljica. 31 Oct 1918 Population rebels against Austria, raises the Italian flag. 19 Dec 1920 Zara annexed to Italy by Treaty of Rapallo (signed 12 Nov 1920). of Diclo, Lagosta Island, and the Pelagosa Archipelago). 7 Jun 1941 - 19 Aug 1943 Subordinated to Italian Dalmatia. 10 Sep 1943 - 31 Oct 1944 German occupation; administered by Italian Social Republic. 31 Oct 1944 Occupied by Yugoslav partisans. 2 Nov 1944 Incorporated into Yugoslavia/Croatia, renamed Zadar.